Asom Jatiyatabadi Yuba Chatra Parishad (AJYCP) blocked railway tracks at Nalbari, Furkating and other parts of the State in protest against Citizenship (Amendment) Bill. The controversial bill was passed in Lok Sabha on January 8 this year, which has led to protests all over Assam, reports Pratidin Time. 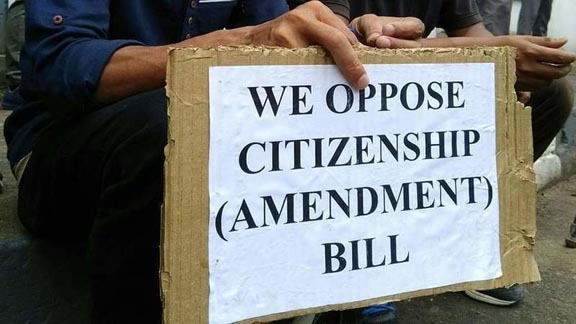 The protesters accused the Sarbananda Sonowal led BJP government of Assam and the BJP government at the Centre for forcefully dumping the Citizenship Bill on people of Assam. “The bill violates secular and federal character of Indian constitution,” said a protester. The members of the organization also expressed unhappiness that chief minister Sonowal haven’t done enough to protect the interest of the indigenous people of Assam and their slogan of ‘Jati,Mati,Bheti’, which helped them win the elections in 2016.